One may think that it is simple to buy an electric fire. It can be, but only if one does a little bit of planning first. This guide will help you see what you need to consider when purchasing an electric fireplace. This is a big decision. Before you make it, you really need to study the layout of the room where it will be used. Some of the choices are a wall mount type. Then within this category, there are some additional options. Some like to have a wall mount that fits into a corner. The next thing to consider is the finish of the electric fire. There are lots of choices here as well. The best choice is one that fits in with the decor. If the home is modern, then a more modern type of finish will be the most appropriate. This is where all the action of the electric fire takes place. It is the box that will hold the artificial logs. There are different styles. Some have a flat panel look to them. Others will give a more 3D effect. The electric fire produces heat through a built-in heater. If one of the purposes for the electric fire is to supplement heat, then careful thought to size has to be given. Also, depending on the size of the room, it may be beneficial to have an electric fire with a fan. That way the heat can be distributed throughout the room better. Study the features and options carefully. 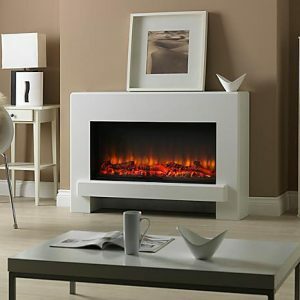 Each make and model of an electric fire will have its own special features. This helps to set them apart from each other. The best advice is to only opt for those that you are going to use the most.